"Although you might expect any extension to hasten the point of calving, it actually remains impossible to predict when it will break because the fracture process is so complex. "My feeling is that this new development suggests something will happen within weeks to months, but there is an outside chance that further growth will be slow for longer than that. EDIT: Though, oddly, there's always more detail in the BBC report than on their own blog. I guess the reporter gets more out of them! That rift width chart is perhaps the more concerning one right now. 500m is very large. I'm not sure if this is an advance, or just the change in satellite view, but it's only a couple of days difference. But it looks like the earlier image (20170118) has the longer crack. Must be a trick of the lighting. One puzzling aspect is how it managed to plow through areas of softer ice, called suture zones, that bind the ice from neighboring glaciers into one giant sheet. "There's something different about that ice that slows it down or causes it to hang up for some period of time," says Dan McGrath, a glaciologist at Colorado State University. But, starting in 2014, that soft ice did very little to slow down this rift. "We need to get to the bottom of understanding what changed that allowed this rift to progress as it has, and will other rifts follow suit," says McGrath, who spent four field seasons camped out on the Larsen C ice shelf. best explanation that comes to my mind immediately is the stone that damages a car's front window and one thinks he can live with that small crack, only to find out that the crack will spread with each movement of the car (torsion) after all this is what happens, there is swell action, there is currents action and there is glaciers pushing out to sea action, sufficient sources for movement that will widen each crack until a part of the structures will detach one or the other way. heading down from the highs of the peninsula and sooner or later pusch that entire ice sheet out into the southern atlantic or beyond. I would have thought the most obvious solution is the weight of unsupported ice. The ice is melting from the bottom and presumably most at the edges. As this occurs the ice has to drop or the ratio of the ice above sea level to below sea level will increase. Somewhere this is going to cause a crack across the ice and the creation of the crack will cause extra pressure at the ends of the crack causing the cracking to accelerate. This rate of cracking would be greater that that caused by swell and currents. If the crack occurs at a point that has been thinned by under-ice currents it is easy to imagine that after the first section breaks off the next section is also vulnerable. The soft ice might prevent the propagation of the crack if it was due to normal tides and currents but would not halt a crack caused by the weight of the ice seaward of the crack. Excellent point DavidR (novice to novice...). Basal melt seaward of the crack is a very good explanation. I wonder if there are any papers on this issue. a very logical and hence valid point IMO, most probably as usual it's a combo of factors while i would second your opinion to have the greater impact than the factors i mentionend. i'd put this on top of the list. The New York Times webpage has an article on the rift, with excellent graphics, front and center today. I think the rift goes just to the left of your arrows. Time will tell. Using this "Sentinel Playground" image, I see the rift going to the circle in the general location image and the enlargement that has two pairs of arrows pointing to the rift. (The lineation - rift - extends slightly above the top pair.) Tealight and I show different orientations, but the end point may be 'the same'. Interestingly, at the end the rift appears to 'split' into several separate rifts. I'm not sure whether this is simply an artifact or real. The rift is currently about 25km from the shelf edge. How would we describe the series of rift-like features approximately 100km north and south of the rift end? It would be amazing to be near the end of it and to hear it groaning and crackling. American Geophysical Union AMA: Hi Reddit, I’m Chris Borstad, and I’m here to talk about the peculiar nature of snow and ice related to avalanches and glaciers. Ask Me Anything! Hi Reddit! I am Chris Borstad, Associate Professor of Snow and Ice Physics at the University Centre in Svalbard (UNIS). Located at 78 degrees north, UNIS (www.unis.no) is the northernmost institution of higher education and research in the world. I am fascinated by snow and ice, and my research relates to processes that cause ice and snow to fracture. Most recently I have been studying the Larsen C ice shelf in Antarctica, where a massive crack in the ice is about to release an iceberg the size of Delaware! By improving our understanding of what caused this event and what the consequences are for the ice shelf, we hope to make better predictions of how other ice shelves around Antarctica will respond to a changing climate. I also study the physics of snow avalanches, a research interest that originated with a desire not to get caught in an avalanche myself while skiing in the backcountry. The most destructive types of avalanches occur after a large volume of snow is undercut by fractures. I am working to better understand these fascinating natural phenomena so that we can hopefully keep people out of harm’s way. I will be back to answer your questions at 12 pm ET, Ask me Anything! Follow me on twitter @RogueChrisB. Please click to enlarge and animate! I find it curious that the crack keeps going "up" (the image) and not "out" (to the coast). Does anybody have ideas, or knowledge, about the stresses on or weaknesses in the ice shelf that would cause the crack to continue to propagate quasi-parallel to the coast? My experience with cracks in glassy materials is that they do not kink but smoothly change direction. So the crack would curve but not take a right turn unless there is a significant defrct. For the shelf a big hill ? has to do with the structure from where the ice originates. glaciers for example use to crack more or less 90 degrees to their flowing direction and i could imagine that this ice is built on or close to land and drifting out, similar like a glacier's ice flows down the valley. there are many experts on glaciology in this forum who can certainly explain it better and/or rectify what's wrong with my assumption. Also the stress profile depends on the anchor points of the shelf. The British Antarctic Service has posted an article with an attached video of the rift - quite striking footage. "On Tuesday, researchers with the British Antarctic Survey released new aerial footage showing the widening rift that threatens to tear the ice shelf asunder at any moment. The footage makes the immensity of the crack clear, as the yawning chasm stretches off into the horizon." The bathymetry around Antarctica has lots of places where, as one moves towards the continent from the off-shore grounding line, the depth actually increases for a while. That means that glaciers/ ice shelves are prone to serious undercutting. That would put the top surface of the ice into tension, whilst the bottom surface is in compression. This is a classic way to produce a fracture, and, like so many other aspects of climate change, it has a nasty feedback mechanism. As the crack propagates, it leaves less of the ice unfractured, with increasingly more of the bending moment being resisted by an ever-decreasing amount of ice. I've vaguely outlined in orange the end of the rift in the shelf and outlined in black a lineation that crosses the rift and goes to the coast. Sentinel screenshot from PolarView Acquired: 05-03-2017 19:14:40. Is the "in black" lineation a weakness of some sort? I noticed what looks like a warm foehn wind forecast for the 10th, blowing off the ice shelf. Maybe that will help things along? I guess to state another way....there seems to be 3 "types" of ice talked about: Land ice, ice shelves, and sea ice. For purposes of the various organizations that measure the "sea ice".....are the ice shelves included or excluded from their calculations? So what that means.....if someone is just looking at the "sea ice numbers" to study "albedo" for instance......those numbers are UNDERSTATING the downturn in the albedo effect from sea ice.....because any shelf ice "lost to melting" doesn't impact the sea ice numbers. Now....I don't FOR A MINUTE believe that the scientists don't know that (I'm sure they do)....and hopefully work THAT into THEIR calculations.....but for a science novice such as me, it is one more piece of the puzzle that "goes the wrong way". Because not only are we continuing to have less reflective sea ice.....we're losing ice shelves as well. Just more "bad news" to plug in......unless ice shelves are GROWING somewhere else in the Antarctic. Well, they get included when they break off, so sea ice will have a big jump soon (I think a year at least). But the ice shelf masks stay the same? So the floating iceberg counts as sea ice but the sea ice replacing it counts as ice shelf! In the sea Ice around Antarctica thread the area is currently (record minimum) around 1,500,000 km2 so 5,000km2 - the size of the potential loss of the shelf is quite small in area % terms - probably lost within normally daily increase / decrease figures though it obviously represents a massive volume compared to thin, surface ice. 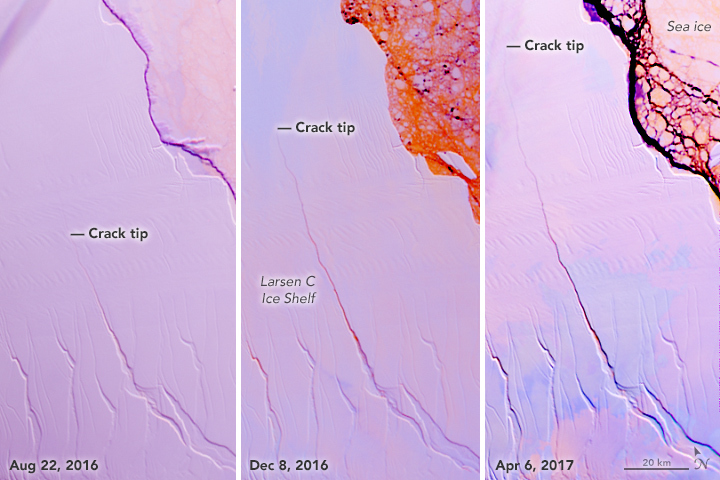 In 2014, a crack began opening in the Larsen C Ice Shelf—a huge slab of floating ice along the Antarctic Peninsula. By April 2017, only 16 kilometers (10 miles) of ice separated the tip of that crack from the open sea. Predicting when the cracking shelf will set loose an iceberg is a challenge because ice fracturing depends on several factors, some of which are poorly understood. The iceberg, which is likely to be the size of Rhode Island, could break off any time from days to years from now, according to scientists from Project MIDAS, a United Kingdom-based group that is monitoring the event. though mainly about foen winds being more prevalent that realised. Depends on how you are using the word "help".